ControlSpace: What's bulky, white, and red all over? What's bulky, white, and red all over? Unfortunately, my Xbox. I hadn't played my Xbox 360 since I took it home for Christmas vacation, so I figured it was about time to relax and have some fun. 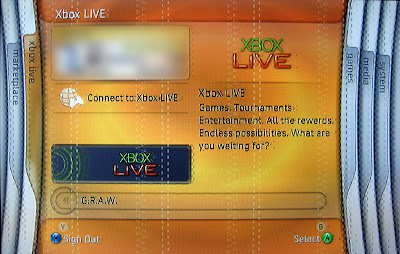 So I hooked it back up to my monitor and turned on the power...hmm, that's weird, what are all those funny vertical lines on my Xbox LIVE dashboard? I haven't seen that before. My Xbox 360 was frozen. Oh well, must just be a glitch. Time to reboot. Second boot attempt: After shutting down the console and turning it back on, nothing happened; the power was on but the console wasn't outputing any video. 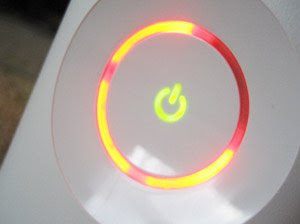 ...the famous Red Ring of Death. Hooray for 3 year warranties! Thanks, can see my blog. Cheer!